Reviewing yesterdays picks. 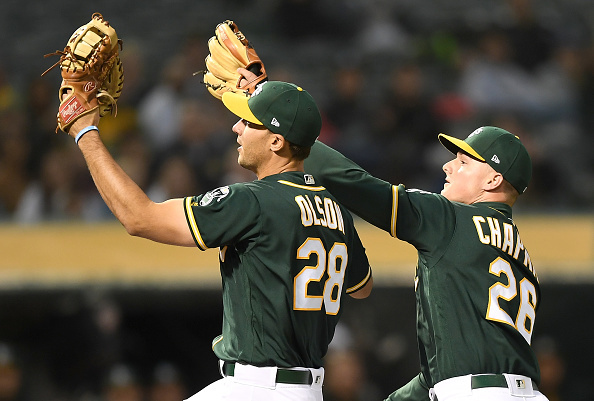 The Good, Matt Olson (18.7 pts) hit a bomb which I said he would, Odubel Herrera (21.7 PTS) hit a home run, Jake DeGrom recorded 12 strikeouts (53 pts), Dallas Kuechel with a solid 8 innings pitched (40 pts). The Bad Carlos Santana (3 pts) he had 3 great hard hit balls but nothing came about it. The Ugly, Rain Delays to Cubs and Blue Jays Players causing them to not even get to play. Onward and Upward. Corey Kluber (11.4k) he is clearly the best pitcher in terms of talent tonight. In any Us Ballpark, he is a lock but the game will be played in Puerto Rico. The ballpark is large I can give you the air density and wind patterns but trust me, he is the safest play tonight. Othani is 10.5k versus Boston is intriguing but so much risk involved with how long will he go and this Boston team has alot of hitters on it. Patrick Corbin (9.5k) is another guy who has been hot of late but to me Its Corey Kluber is the safest play, pay up for pitching tonight. Jhonny Cueto (8.1k). I mean 8k for Cueto is cheap, he is priced down because he is coming off the DL and is facing a hot Diamondbacks team but he is such a good pitcher and for that price, you have to consider him but again a risk but of DL & Diamondbacks. Zach Wheeler (7k) he is a great option for a pitcher who is talented but injured often. Against an injury-filled Nationals it's not a bad play but ultimately pay up for Kluber and live with the results. Chick dig the long ball and so does fan duel. Any Astros tonight. Pick your poison, since this is recommendation column I would recommend Jose Altuve (4.6k) and Carlos Correa (4.7k) they are going to put up numbers against the marines it's only a matter of time. Justin Upton (4.3k) I think he has a big game against David Price who is coming off a 1 inning performance with a hand issue. I think he hits a bomb tonight. He is an interesting high-end play. Also, my gut feeling is that Othani (10.5k) might be the real deal and strike out Boston I'm just concerned about his pitch count. Matt Joyce (2.9k) barely fits the category he is a cheap but good play tonight versus the white sox. I like that play and I like the A's versus this white sox pitcher. Tonight I'm going to with Carlos Correa to be the Topps player because of the matchup and the fact that the Astros are looking to put up runs against the Mariners. He will be the best player tonight with a home run and a few RBI's for this Astros team. Play Astros and A's and play some power bats in your lineup. Topps, the premier trading card for baseball fans everywhere. I can come up with better sales lines for you TOPPS, all you need is to contact me for a sponsorship. Newer PostRaptors Take 2-0 Series Lead..